Novel imaging approaches have allowed measurements of the anthocyanin induction in onion epidermal cells that can be induced through water stress or transient expression of exogenous transcription factors. Environmental and genetic mechanisms that allow the normally colourless inner epidermal cells of red onion (Allium cepa) bulbs to accumulate anthocyanin were quantified by both absorbance ratios and fluorescence. We observed that water-stressing excised leaf segments induced anthocyanin formation, and fluorescence indicated that this anthocyanin was spectrally similar to the anthocyanin in the outer epidermal cells. This environmental induction may require a signal emanating from the leaf mesophyll, as induction did not occur in detached epidermal peels. Exogenous transcription factors that successfully drive anthocyanin biosynthesis in other species were also tested through transient gene expression using particle bombardment. 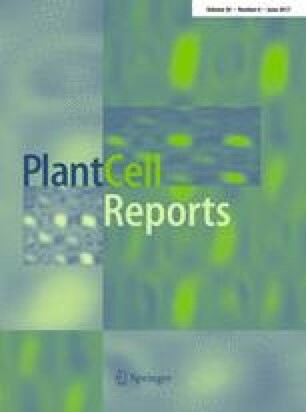 Although the petunia R2R3-MYB factor AN2 induced anthocyanin in both excised leaves and epidermal peels, several transcription factors including maize C1 and Lc inhibited normal anthocyanin development in excised leaves. This inhibition may be due to moderate levels of conservation between the exogenous transcription factors and endogenous Allium transcription factors. The over-expressed exogenous transcription factors cannot drive anthocyanin biosynthesis themselves, but bind to the endogenous transcription factors and prevent them from driving anthocyanin biosynthesis. The online version of this article (doi: 10.1007/s00299-017-2132-1) contains supplementary material, which is available to authorized users. This research was funded by the University of Canterbury College of Science (DAC), Plant & Food Research (CCE), and a grant from Invitrogen NZ Ltd (EJW). EJW thanks the New Zealand Federation of Graduate Women (NZFGW) for financial support. From Plant & Food Research, Palmerston North, we also thank Kevin Davies and Andy Allan for their comments on drafts of the manuscript, and Nick Albert for comments and assistance with phylogenic trees. These experiments were conducted in accordance with New Zealand regulations concerning genetic modification of organisms, and NZ EPA decision GMD08056.